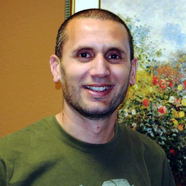 Munir Iqtish is an active member of the MAS Bay Area Chapter. He recieves his Islamic education through MAS Tarbiya/self development programs and is studying with various scholars and teachers. Munir has extensive experience in dealing with the youth, as he's worked with Muslim youth and young professionals for several years. Munir's dynamic speaking style allows him to connect to young adults as well as relate to rest of the community members. Munir currently works for Islamic Relief USA, and is married with three children.